February 2014 | Oh Sarah O ! What I'm Listening To: CHVRCHES- "The Mother We Share"
This week I've been listening to Scottish Synth Pop band, CHVRCHES. If you recall, I previously posted about them here. The group will be touring throughout the UK and Europe in March but unfortunately they're already sold out, but my friends in the States can catch them this spring/summer. The song "The Mother We Share" is one of my favorites right now. Week 4 of the Wardrobe Architect series was focused on creating silhouettes that we feel most comfortable. For the exercise we were asked to create some formulas for what we like to wear. First I thought I'd examine some silhouettes I actually wear. Normally I'd think that this silhouette might be unflattering to my pear/triangle figure since the top skims the smallest part of my body (my waist), but some how this seems to work on me. Usually I try to avoid shorts because I don't feel that my legs are my best asset (and let's face it, I don't like to shave), but sometimes the hot weather makes shorts unavoidable. Because my printed shorts are black and white they almost act like a neutral colored short and disguise my bottom half. My striped 3/4 sleeve tops are my favorite clothes of the moment because the neckline is flattering and it shows off my shape. The high waisted belt on my shorts hits close to my smallest part accenting my small waist. Since I currently work in a school, my fall/winter wardrobe mostly consists of what I wear to work. I like for my clothes to be easy to mix and match freely. This is my typical work uniform on days when I don't feel like giving my clothing too much thought. Another work uniform. I'm not sure if the colored crops work with my pear shaped figure, but sometimes I like a pop of color. This is my attempt at being a little trendy in the casual work environment although I'm not sure how flattering the sweatshirt is on my figure. It's really important for me to wear silhouettes that flatter my triangle/ pear shaped figure, so next I examined silhouettes that I like, but don't necessarily wear. I don't have a good day-to-day midi skirt, but it seems like this would be a good silhouette for my body shape. I do own a circle skirt, but I don't get to wear it as much as I'd like to. Not so long ago I used to live in cardigans and blazers in the fall and winter, but blazers and cardigans seem to formal to wear at my current job. I'd love to re-incorporate them into my weekend wear. I don't wear dresses very often, but when I do I feel that these are the most flattering. I don't think I have any "flat-front" shorts, but it's likely that this style would be most flattering for me. As Sarai said, this exercise was a huge eye opener for me and really helped me to see where the holes in my wardrobe are, and where I could be a little more critical. I can't wait to see what the next challenge will be. Now I'm sure many of you had better things to do than to watch the Graham Norton Show on the BBC this past Friday, but if you caught it you would have seen a hilarious interview with Matt Damon, Bill Murray and Hugh Bonneville who were on the show promoting their latest film, Monuments Men. I'm pretty sure they all had a little something to drink before coming on the show. All I can say is, I had no idea Lord Grantham was such a lush! This week I just can't seem to get enough of HAIM. I've been jamming out to HAIM's "The Wire" karaoke style. I just can't get it out of my head and it's so fun to try to imitate their inflection!. Give it a try and you'll see what I mean. The third instalment of Coletterie's The Wardrobe Architect explored shape- as in the shape and construction of the garments we prefer to wear. The worksheet asked us to rate the fit, length and shape of various garments on a 1 to 10 scale to show our preferences. My ratings tended to favor garment shapes that are said to flatter a pear shaped body. Right now my closet tends to favor bootcut jeans to skinny jeans. I tend to prefer fitted tops with sleeves (no cap-sleeves or tube tops), I favor full skirts to pencil, and I prefer knee-length and longer skirts. Hello everyone! The Peter Pilotto for Target collection was released today and so far there are still tons of pieces available online. The collection is a bit too print heavy for my tastes (which is saying a lot because I love prints), but after seeing some celebs show off some pieces at the Target launch party, I got a better idea of how these pieces could be incorporated into an everyday wardrobe. Will you be picking up any pieces from the Peter Pilotto for Target collection? I would love to hear your reviews on how the pieces look/fit in person. Let me know in the comments below. Last week I told you about the Wardrobe Architect personal style series on Coletterie. This week the worksheet (available here) was all about uncovering the styles that make you feel like yourself and attaching words to them. When I'm wearing my favorite clothing I feel confident and perky like a freshly groomed poodle (that's my own personal analogy). My favorite clothes tend to make me fell polished and tailored and are flattering to my body shape. self-conscious- I worry that other's will think I'm trying to hard, I'll look out of place, or I'm exposing too much skin. frumpy- Nobody likes unflattering clothes. boring- I worry that my clothes are too generic with no personality and just fade into the background. There isn't one particular celebrity that really embodies my personal style, but there are several that I admire because they seem to have developed their own, marked personal style that works for them. Katherine Hepburn- She wore those classic menswear inspired pants outfits that looked so effortless. I rarely wear dresses and love a good pant and I love menswear fabrics and prints. Alexa Chung- It's not secret that I love Alexa's style (see here and here). I love that she has a hip, young,edgy and easy style with hints of vintage and feminine pieces. Zooey Deschanel- I'm not sure if the feminine look really works for me, but I love that Zooey has a girly and quirky style. Her outfits seem to reflect her personality and they always make me smile. Sofia Coppola- While I don't always love her movies, I do envy her minimal, modern, menswear inspired style. It feels very French. Follow Sarah O's board Personal Style on Pinterest. Feminine- I'm not all pink and sunshine. Retro- I like vintage style but I don't want to be a total rockabilly chick. It looks like it'd take too much effort. Glam- This seems too frivolous and fussy for my lifestyle. easy. timeless, artistic. modern. quirky. 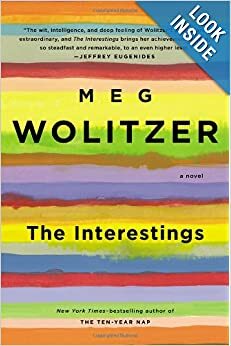 One of my New Years Resolutions was to read more in 2014 and I just finished reading The Interestings by Meg Wolitzer which was the January book selection for A Beautiful Mess' online book club. The story follows the lives of (primarily) four friends who meet at a summer arts camp called Spirit in the Woods in the 1970s as they grow into adulthood: there's Ethan- the ugly one who is a brilliant illustrator and the moral compass of the group; Ash- the pretty one from a well-to-do family and seems to have had success handed to her as she becomes a playwright; Jules- the awkward comedian who attends camp on scholarship and longs to be an actress, but instead becomes a social worker; and Jonah- the son of a folk-singer and has the talent to be a musician himself, but an incident from his past leads him away from music and towards engineering. One of the ironic things about the title is how un-interesting and ordinary the characters are (which isn't to say that this is not an interesting read). Although I myself did not ever attend a summer camp and I'm of another generation, it was easy to relate to these characters at times and to relate these characters to people I have known. Perhaps the most interesting character of the bunch is Julie aka Jules who starts of as the outsider of the bunch, but for reasons unknown the group decides to let her in. However later in life, as Ethan and Ash become successful in the arts Jules again plays the outsider as her friends become wealthy but she is not. This book touches on many heavy themes such as the idea of classism, jealousy, and feminism and there is an incident that happens at the end of their summer-camp days that leaves us to question the morality of one family. If you've read the book, you can join in the discussion on A Beautiful Mess and if you'd like to join in on February's book, they are reading The Fault in Our Stars by John Green. It looks like a tear jerker! In December one of the local news anchors from my home-town, Wichita, Kansas, made a fatal mistake. Thinking that the cameras had cut away and turned off the sound, Justin Kraemer dropped the f-bomb, saying "lets get the f*ck out of here", but unfortunately his mic was still on and some folks at home recorded the blunder which later turned up on The Gawker, The Huffington Post and Jimmy Kimmel Live. Consequently, Justin Kraemer lost his job at KSN. Rather than go into hiding, Justin Kraemer decided to capitalize on his new-found fame and released a YouTube video about his life after the f-bomb. It's actually pretty funny! Enjoy!